Merry Christmas! I got you some “New Toys!” And doesn’t that blandly descriptive title sound like a placeholder that someone forgot to switch out for something more evocative? Well, if your goal in reading these Firestone stories is to examine Barks’ progress as a storyteller, it sure isn’t helpful that this fourth one had him just reworking someone else’s script. Well, apparently—my understanding of just how this worked is a little hazy, but it’s hard not to think that if he’d been working on his own, he’d have felt compelled to come up with a narrative that was at least a little more sophisticated. Though I suppose it would’ve been a welcome respite for him not to have to, for once. And now, “Three Good Little Ducks,” and I will eat my hat if Barks was not being a little bit sarcastic with that title, mimicking that kind of goodie-two-shoes children’s narrative. The story itself? Well, it’s my favorite of the five. I think it’s pretty much a winner in every respect. Let’s see, shall we? 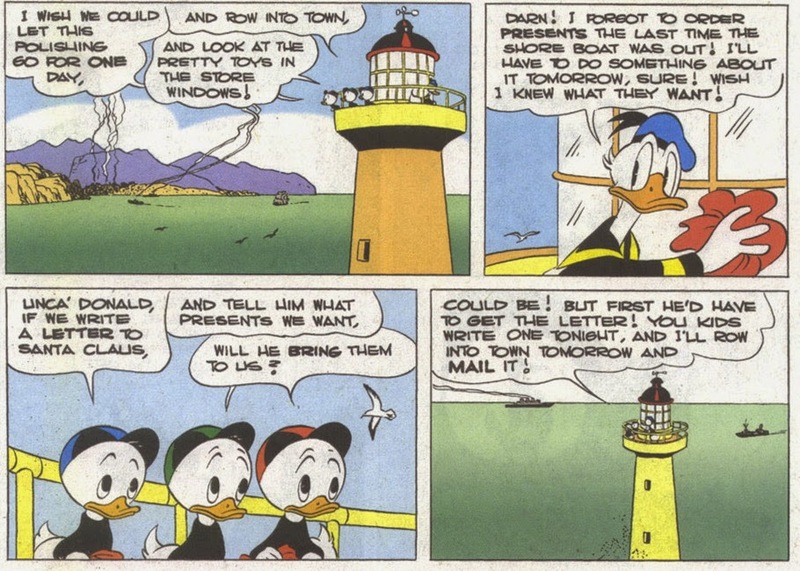 Look, I’ve said it before and I’ll say it again…well, okay, maybe I haven’t said it, but I’ve definitely thought it, dating back to when I was very small: it would be fun to work in a lighthouse. A nice cozy space with a great view—what’s not to like? Okay, so the reality would probably be less cool than my imaginings, but those imaginings are pretty darned nice. Hey, everyone. Yes so obviously I’ve been an absent parent to this blog lately, but I swear to you, I have no intention of writing exclusively seasonal entries from now on (yeah, promises, promises). I have been so busy lately, you wouldn’t believe. Gah. Still, hopefully I can make up for it just a bit with A Firestone Christmas, in which I cover the five Christmas stories that Barks wrote as giveaways for a tire company, of all things, every year from 1945 to 49. Looking back, it seems kind of bizarre that Western had the guy whom they knew damn well was their best talent by a wide margin write so many stories for promotional giveaways. Then again, your Strobls, your Murrys, your Mooreses, all did more of them than Barks ever did--it's just that theirs are justly forgotten. Maybe all of them just had to put in their time in the salt mines. AT ANY RATE, the advantage is ours.